Check the calendar to find out what is coming up next!! parties and are open to the general public. 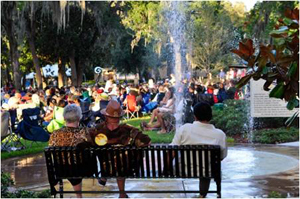 These events are permitted by the City of Casselberry and will take place in City Parks or right of ways. They are not organized or managed by the City of Casselberry. The City of Casselberry is not responsible for the event programs; nor can the City guarantee that the non-City events will take place as posted. This beautiful lakefront park, with its 150-year old oak trees, shaded open lawn area, amphitheater, playground, and sculpture garden, is a great event venue for all ages. Throughout the year, Lake Concord Park hosts many exciting events, many of them FREE to the community! Across the street from City Hall, Lake Concord has expanded to include more beautifully landscaped walkways, 2 lit fountains, benches, bike racks, an open lawn area for pop-up events, small amphitheater area, kids' playground (coming in March 2018) and 8 pedestals for new sculptures. Bring a friend and come enjoy a quiet morning stroll or a spectacular afternoon sunset at the park. General parking for events is available on the west side of City Hall located of Municipal Way, Fifth Third Bank, and Home Depot. Disabled parking is available at the front of Casselberry Police Department. Parking is limited so come early or carpool with your friends or neighbors. For more information about special events or if you are interested in sponsoring an event, call 407-262-7700 ext. 1507. View the slideshows on these previous events.